How many times did you go sledding with your kids and watched in horror as they kept sledding down the hill and further, towards a frozen stream or perhaps your neighbor's fence? With this sled ride calculator, you will be able to assess how far - and how fast - your kid is going to ride. All you have to know is how high the hill is, and what kind of sled is your child using. Hill inclination: there's a substantial difference between going down a gentle slope and a steep hill. Input the inclination of the hill measured as the angle that the slope makes with the horizontal. Hill height: the height of the hill at the highest point, measured vertically. Length of slope: the total length of slope along which your child will move. If you know this value, you can input it directly and neglect the previous two. Gravity - this force acts downwards and is equal to the mass multiplied by gravitational acceleration (g = 9.80665 m/s²) and denoted by mg.
Normal force - this is the force exerted on the sled by the ground. 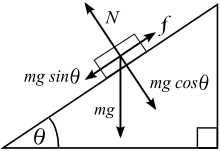 It is perpendicular to the slope and denoted by N.
Friction - friction acts in the direction opposite to the direction of movement. It is equal to the normal force multiplied by a coefficient of friction μ. It is denoted by f.
The resultant force will cause acceleration down the slope. Surprisingly, this acceleration is not dependent on the mass of the child. After the sled reaches the bottom of the hill, it begins to deccelerate until it comes to a complete stop. That is because the only force that now acts on the sled is the friction, directed opposite to the direction of motion. Knowing the speed that the sled gained during the descent down the hill, you can easily calculate the decceleration and the time it takes for the sled to come to a complete halt. Remember that the calculated results don't take air resistance into consideration. Hence, the distance traveled by a child on sled will always be a bit smaller in reality. 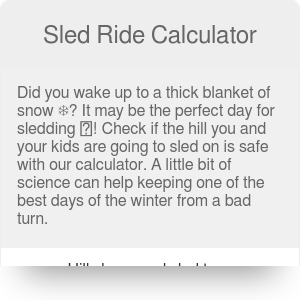 Sled Ride Calculator can be embedded on your website to enrich the content you wrote and make it easier for your visitors to understand your message.